An undescribed species of Roa at the California Academy of Sciences. Note the brown pelvic fin and white spine. Photo credit: Lemon TYK. 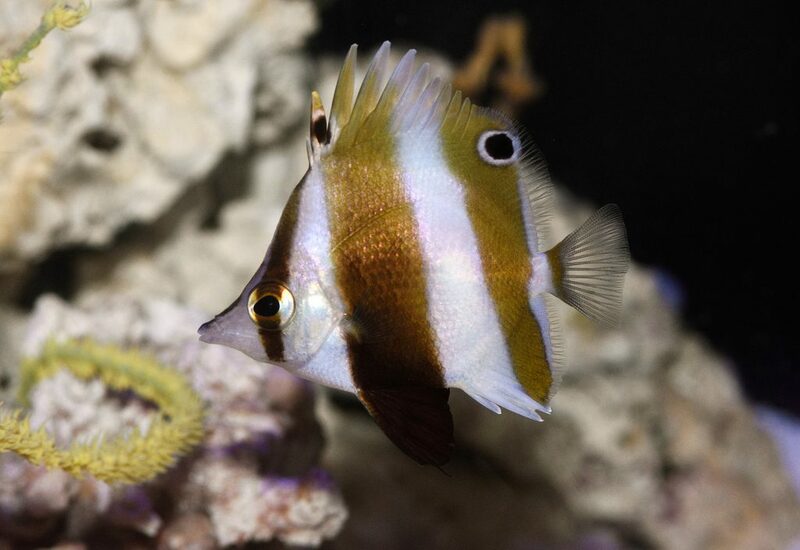 Roa is a seldom seen and poorly known genus of butterflyfish. With only four taxonomically described species, the genus has just about as many undescribed ones! In other words, of all the known Roa butterflyfishes to exist, at least half are not assigned with taxonomic nomenclature! As with many other poorly known fishes, Roa butterflies are denizens of deepwater, preferring to skulk in reefs well over 300ft (100m). It comes as no surprise then, that the genus is so poorly revised. 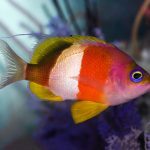 It comes as an even bigger surprise, however, that the Steinhart Aquarium at the California Academy of Sciences houses not one, but two of such examples. Two living, breathing specimens of distinct, yet undescribed species. Another undescribed species of Roa. Note the black pelvic fin, as well as the associated spine. Also note the ocelli on the anterior dorsal fin spines. Photo credit: Lemon TYK. The two new species of Roa are remarkably similar, but hints at some minor differences, especially with regards to the pelvic fin coloration. One sports the more typical brown, with the associated spine colored white, while the other has it completely blackened. 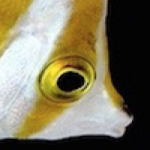 The latter also has a prominent ocelli on the anterior dorsal fin. 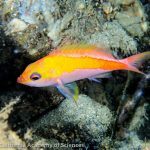 In our previous article discussing this genus, we mentioned that the “brown-finned-white-spined” species ranges from southern Japan, down to Taiwan and the Philippines. While we don’t know how extensively the species ranges for certain, it is most likely that it is restricted to the Coral Triangle. Interestingly, the black finned phenotype is sympatric in the same region of the Philippines, having been collected together by Brian Greene et al., during the last expedition trip there. Wether or not the black-finned phenotype represents another species is uncertain, but the presence of more than one individual, all of them with consistent patterns, suggests that it might be. These are currently being studied in closer detail. Another deepwater rarity, Prognathodes guyanensis. Photo credit: Lemon TYK. The two Roa aren’t the only butterflies hogging the twilight (pun intended). Prognathodes guyanensis is another illustrious species on display, except this individual hails from the deepwaters of the Western Atlantic. 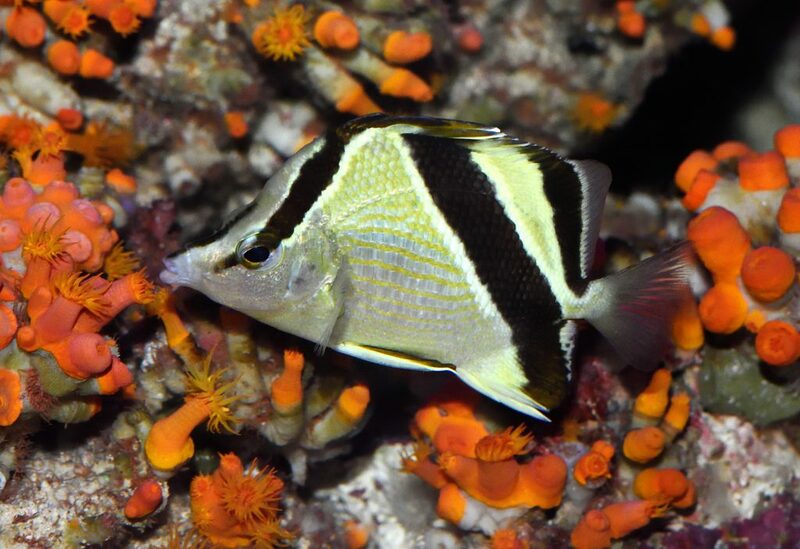 Like Roa, Prognathodes is another genus of deepwater butterflyfish. Unlike the former, however, Prognathodes is circumglobal in distribution, being found across the world in the Atlantic, Indian and Pacific Oceans, but only in deep waters (the exception being P. aculeatus). A more in depth account can be found a previous article. Prognathodes guyanensis is most often collected for the trade from Curacao, in the Caribbean. It is rarely offered, and when it shows up, commands a high price tag. Needless to say, it’s a species that is not often seen. The silvery body contrasted with clean, black oblique stripes make for a dapper looking species. If these butterflies, as well as the previous lineup of rarities that we’ve mentioned isn’t reason enough to visit the academy, then perhaps nothing will. If you’re around the bay area, do take a day to check the Steinhart Aquarium out! I promise you it’s worth it. 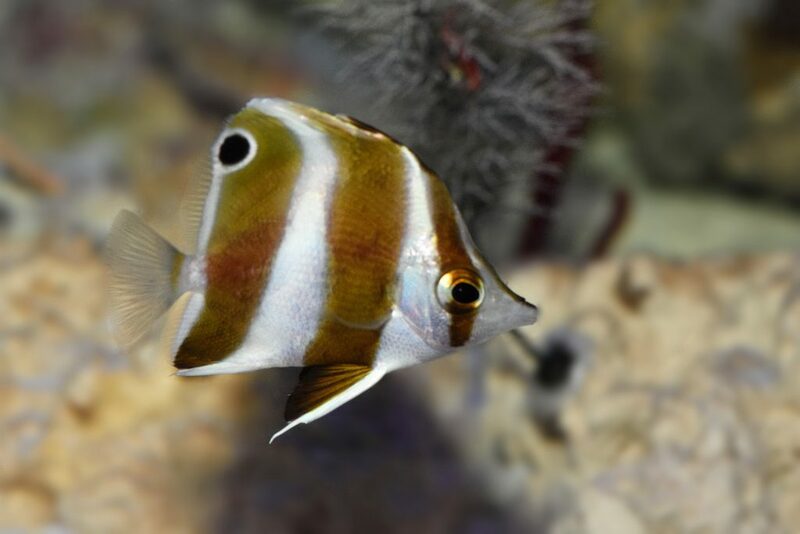 Lemon is a reef fish fanatic with an academic diploma in biotechnology. Like many, he started toying around with the fresh water hobby but quickly grew into a proficient hobbyist in the marine scene. His passion for the natural world sees him travelling to far flung, exotic places, where his secondary love for photography comes in handy. 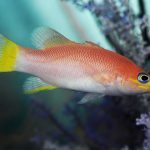 At 23, Lemon is one of the youngest and most prolific fish writers, and is well known for his obsession with the wrasse genus Cirrhilabrus.